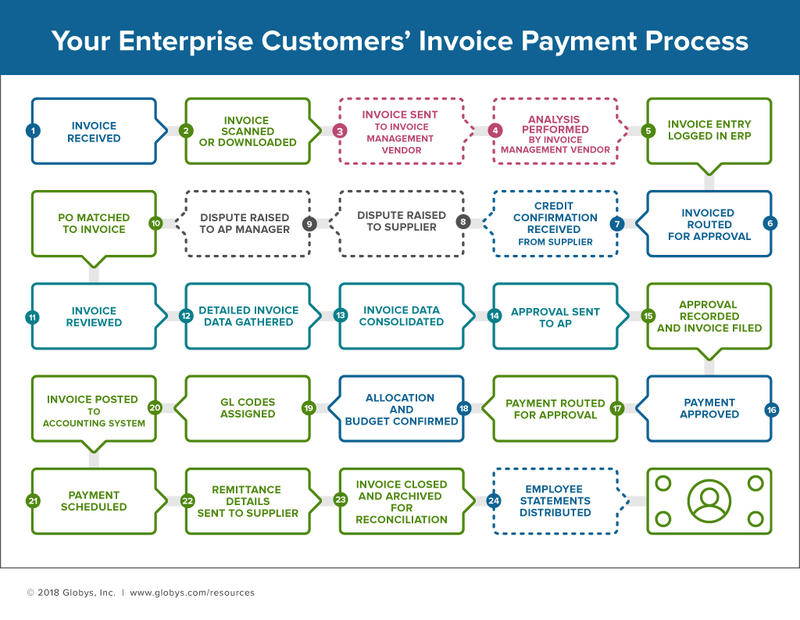 In this post, we provide an insider’s view into the invoice payment process that your enterprise customers are using to pay you. You’ll learn about the different roles who are interacting with your invoices in some form or fashion throughout this process. The question to ask – is your enterprise billing and payment experience accelerating or delaying the process that gets you paid? Once your invoices are delivered to your enterprise customers, what steps are required to move the invoice to a point of payment? Here’s a hint – it can take more than 20 steps and 8 different roles before a payment is earmarked for you. Whether completely archaic, highly-automated, or somewhere in between, these large organizations have a common sequence of tasks attributed to the invoice payment process. The mission is simple – ‘pay only the bills and invoices that are legitimate and accurate.’ What’s not so simple? Validating which invoices (or which portions of the invoices) are ‘legitimate and accurate’. As suppliers, the focus is often on faster invoice delivery and payment processing. But does cutting off a few days at the beginning and end of the invoice-to-cash process accelerate payments, when your customers’ 20-step process remains the same? What are the steps required to move the invoice from receipt to payment? Who is responsible and what do they need to accomplish each task? Which of these steps are common culprits of delays or errors? No, you’re not going to change their process or become an AP expert. But understanding the invoice payment process – from your customer’s point of view – will help you determine if your billing and payment experience is aiding in efficiency (or not) to these required steps. Here’s an insider’s view into the 20-step process that gets you paid and the players responsible for making it happen. Share this with your internal teams, validate it with your customers, and identify the areas where your billing experience is either accelerating or delaying this process (more to come on this in a future post). Accounts Payable Manager: This role oversees a team of clerks and supervisors responsible for all accounts payable functions. They are tasked with monitoring the daily operations and making sure spending adheres to budget. Accounts Payable Clerk: This role is responsible for completing payments and controlling expenses by receiving, processing, verifying, and reconciling invoices. A large portion of time is allocated to recording invoice entries into the company’s financial system and monitoring payment-impacting activities (discount opportunities, purchase order/contract/invoice/payment discrepancies, missing documentation, outstanding credits, stop-payments, etc.). This role is measured by invoice processing time and accuracy. Accounts Payable – Invoice Validation: For large companies processing thousands of invoices per month, there is a dedicated role or team solely responsible for the validation between purchase orders (PO) and supplier invoices. Success of this role is dependent on matching the PO to the right invoice, reviewing every associated line item, and identifying any discrepancies prior to the invoice moving forward for approval and payment. Departmental Accounts Payable Manager (e.g., a specific location): Many corporations operate a decentralized Accounts Payable model where each specific location or entity is responsible for the receiving, approval, and payment of their associated invoices. This Departmental AP Manager is responsible for the payment process of a particular location or region. Service or Supplier Management (e.g., a specific expense type) (Approver): When a specific service represents a significant expense to a company, a dedicated role is assigned to manage that relationship and all associated charges. As new orders are placed or services are changed, this role is responsible for validating services and ensuring they are in accordance with contracted rates. They are also responsible for identifying ways to optimize spend and the supplier relationship. For large organizations, this can amount to analyzing thousands or millions of line items on a monthly basis. Line of Business Manager (Approver): Before supplier invoices are paid, they need to be approved by the line of business associated with the charges. The line of business manager is responsible for the review and approval of all expenses associated with his or her reporting structure. Invoice Management Vendor (outsourced): Over 50% of large enterprises have contracted a portion of their invoice auditing and management to a third party vendor. This vendor is typically responsible for auditing invoices to ensure alignment with POs, contracts, and service orders. The majority of these relationships employ an hourly payment structure, as well as additional payouts for identifying discrepancies. Individual employee: Depending on the service provided, there is often a need to not only provide invoices and data at the company level, but also down to the individual employee level. Some company policies require employees to pay a portion of the charges for anything outside of the company-covered policy. With this in mind, this role is looking to easily validate the actual usage and charges that were incurred for their specific service.